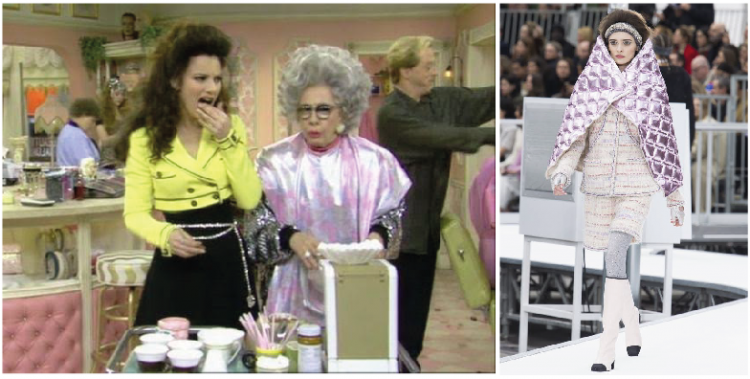 Nanny Fran Fine a fashion icon in many ways, her style will never die (although the sitcom sadly ended a few years ago) and I found proof, lots of proof. In every show of the past fashion weeks (Fall/Winter 2017), I noticed and recognized silhouettes and shapes but also fabric choices and prints that we can find in Nanny Fine's wardrobe. Grandma Jetta in her foil robe versus the Chanel FW17 metallic cape. The leopard print Nanny Fine wears a lot will not be out of style yet. See the shape of this collar!!! Balenciaga and Ellery totally get this and present this print and this silhouette like we never saw it before. This off the shoulder poofy top of Ellery is an exact copy of Fran Fine her cropped ruffle top, that I adore. In color Nanny Fine is always super on point, see this slick suit from Tibi and this fake fur robe from the Prada collection, that suit her wardrobe perfectly. The Prada collection of FW17 is a bold fake fur fiesta, a style you can recognize immediately. It's like walking into Nanny Fine her closet, what more can we ask for?